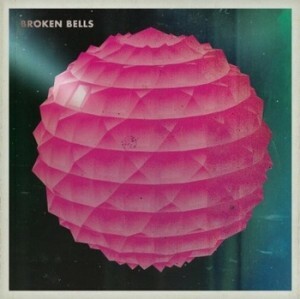 Broken Bells is producer extraordinaire, Danger Mouse, and Shins’ vocalist, James Mercer. Their mutual admiration goes back to a meeting at a music festival in 2004, but they did not start collaborating on the project until late 2008. Danger Mouse has worked his production magic, lending his skilled hand to the likes of Sage Francis, Beck, The Black Keys, the Gorillaz, and was, along with Cee-Lo Green of Goodie Mob, Gnarls Barkley. He also won acclaims for his mash up of the Beatles’ White Album and Jay-Z’s Black Album into The Gray Album. With Mercer as his new muse, Broken Bells could be Danger Mouse’s greatest feat. Mercer went beyond his usual stylings in melody and voice, to distance himself from the Shins, to make Broken Bells as distinct project, a separate entity of its own. By being so daring, he did expose himself and pushes the limits of his range. It becomes more apparent as the album plays on and I found myself more interested in the production than the songs themselves. There are some stellar songs on the album, in fact they stand very well on their own out of context from the whole piece. But, there isn’t enough variance in tempo. the album bogs down in the middle and I found myself disinterested. When I went back and revisited the album, particularly track 7, “Citizen,” a song I nearly dismissed when listening to the completed work, I enjoyed it much more on its own. I has touches of a classic Bowie/Eno composition. At that realization, I thought I’d love to hear Bowie and Eno traipse through the number. I had similar thoughts with “The Ghost Inside.” How would this song sound with as a Gnarls Barkley record with Cee-Lo singing. I respect Danger Mouse. His studio trickery makes all his endeavors interesting enought to plop a twenty on the counter. But this recording makes me somehow wonder if his production is supposed to distract me from the overall quality of the songs on Broken Bells. The piece is worth repeated listenings, but I don’t know if I trust it. Posted on Monday, June 7th, 2010 under Record Reviews. You can follow any responses to this entry through the RSS 2.0 feed. You can leave a response, or trackback from your own site.